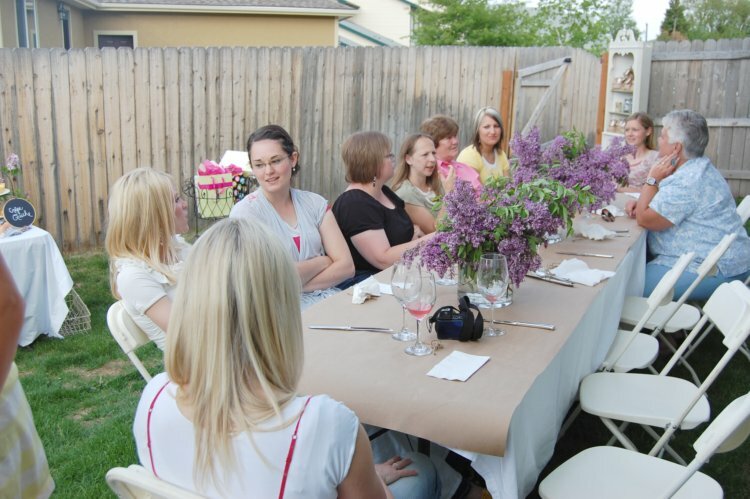 When Jen called me a couple months ago about helping her plan a baby shower, I was thrilled. I mean, we already know I love to plan a party, but planning one with a close friend is the best. Jen sent me this picture as inspiration and the ideas started flowing from there. There were many late night phone calls and long-winded emails as we planned the shower 200 miles apart. On a Thursday night Z-cakes and I landed on Jen's doorstep at 10:45 PM. The next morning was a flurry of grocery trips, baking, soup running over on the stovetop, and blowing noses. (Did I mention Z-cakes was sick? Because she was. Sick.) We were still putting together the final touches as people were pulling in the driveway. 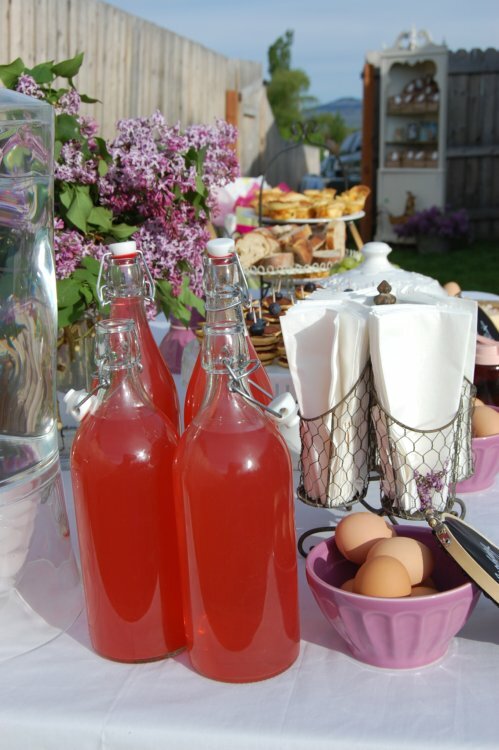 Luckily we got everything looking presentable before most of the guests arrived. In the end it all came together perfectly. The weather was gorgeous and it is hard to beat the scenery in Salmon. It was the perfect backdrop for our rustic shower. Okay. Time for the pictures. Because you and I both know that is what you're here for. After two full days of giving our toddlers full control of the house, we definitely did not want people walking through Jen's living room. We kept the front door closed and made a sign that fit inside the wreath already hanging on Jen's door to direct people to her back yard. 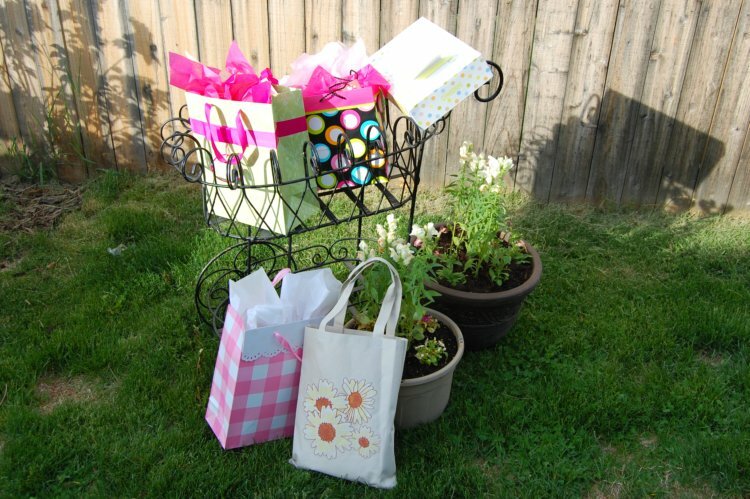 Upon arrival, guests were asked to place their gifts in this cute decorative baby carriage. A local antique store loaned it to us because Jen is such a good customer! 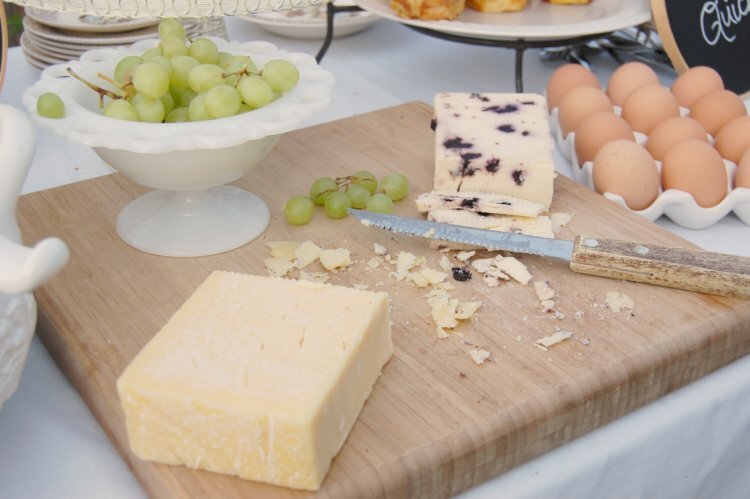 The guests were then greeted by everybody's favorite thing about parties: the food table. While the mama-to-be was opening presents we asked each guest to share their favorite thing about being a mother (inspired by the lovely, Dandee). I wasn't present for most of this part, but I did hear a lot of laughter coming from this fun bunch of ladies. As the guests left, they were given a favor bag full of cookies. 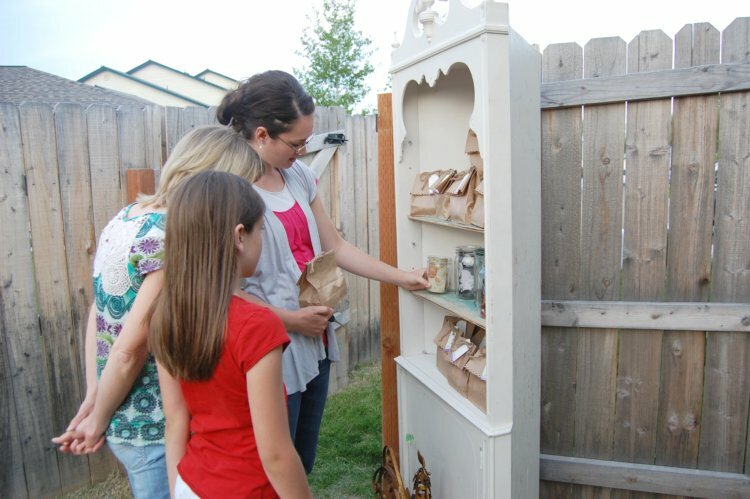 Jen was once again the brains behind this favor setup. We moved this cute corner bookshelf out of her bedroom just moments before the guests started to arrive. I am a big fan of shopping for decor in your own house and when you decorate like Jen it's easy! And now, a few more pictures. Because I can't resist. :: Jen is one of the best friends a girl could have. She just is. :: Parties take a ton of work. Especially when you have to do most of the legwork the day before. By Sunday Jen and I were both exhausted and our feet were aching. In other words: prepare yourself. :: Pinterest is your BFF when event planning. It was a great way for Jen and I to put together an inspiration board just for this shower even when we were miles apart. 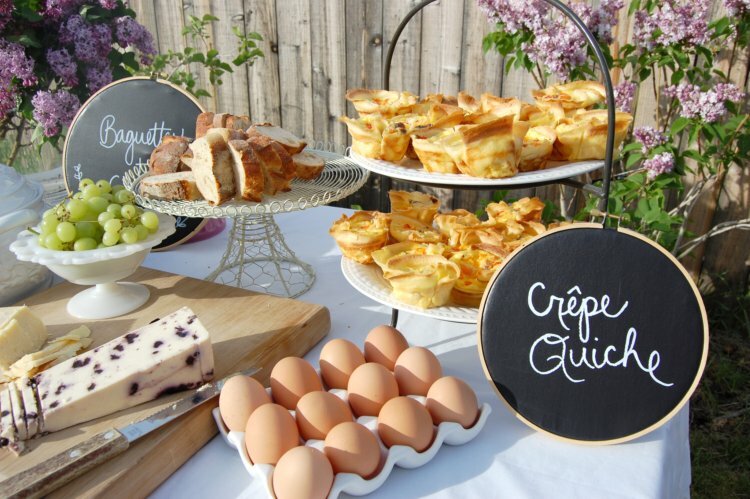 Check out my party planning board to see a few more pictures that were the inspiration for this party and much, much more. 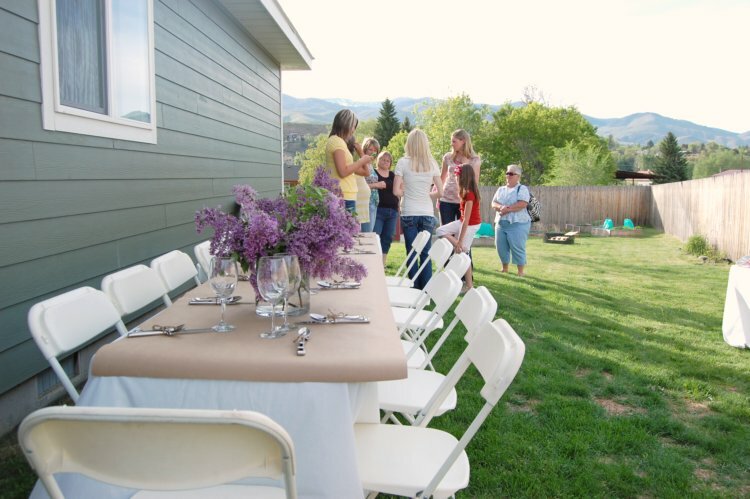 :: I LOVE PLANNING PARTIES and I want to plan more. In fact, if you need help planning your next big shindig, please email me at mirmandy27@yahoo.com for more information! So what do you think? I'll be answering any questions you have in the comments and a "behind the scenes" look at a couple of the shower details is in the works! What a soiree! So cute. Want to come to Nebraska to throw my next party? Heavens, Miranda. This is beyond delightful! Everything is so, so pretty. 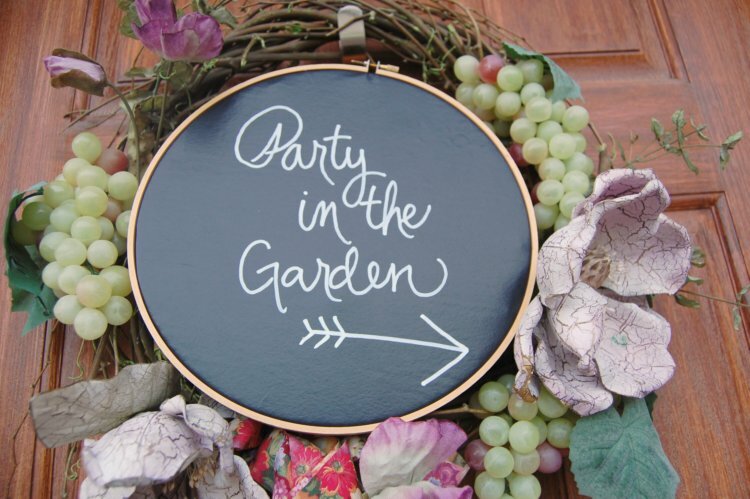 And yes, Pinterest is the best party-planning idea source. I pretty much have parties planned up until my children have children. 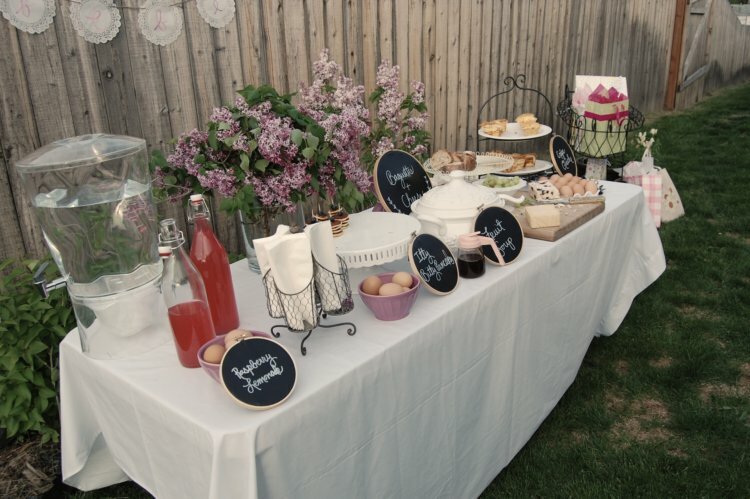 I love the design of the food table and the rustic look of the lilacs and runner. Amazing work! What a fantastic party, Miranda. 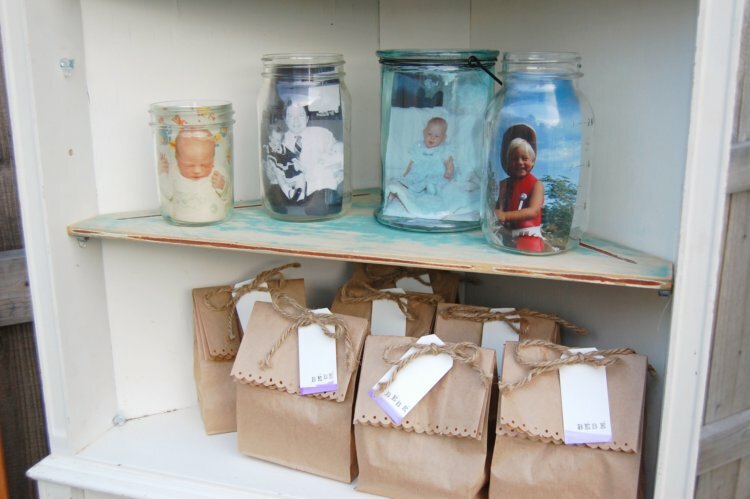 And I so agree about pinterest- it makes organizing ideas for so many things just too easy- love it! Holy Moly, Mandy! What a party! I am hosting one in a couple weeks. I wish I could hire you to be my party planner. Lucky mama who had you for a party host. 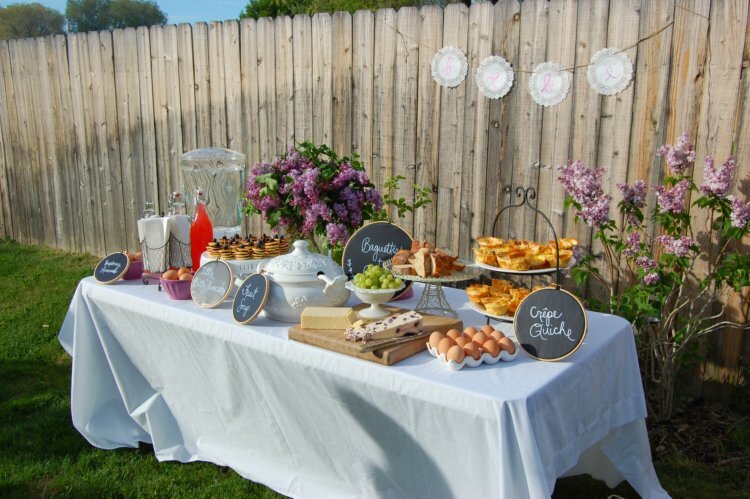 Very cute party, I love all the details you put to make look and I am sure feel so perfect for the guest of honor and all the guest. Thanks again Mandy million times over. You are the best! delightful! How wonderful that you could have it outside with weather that cooperated and LILACS. sigh. I love crêpe quiches. And good cheese. And eggs as decor. 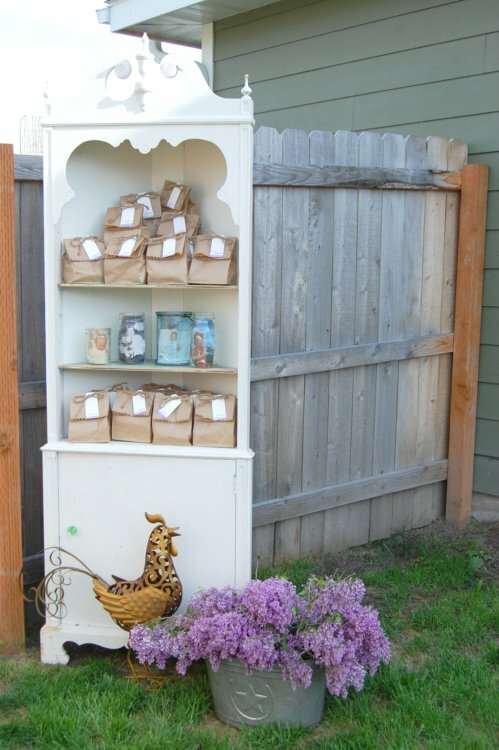 Love the furniture outside and the darling favor bags! I'm feeling a bit stressed out just imagining pulling all this together with a sick little one. those itty bitty pancakes? adorable. heck, the whole thing is adorable! 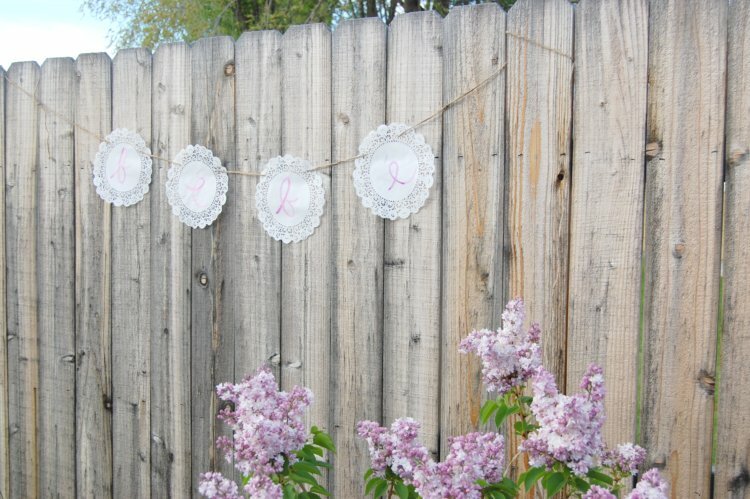 I think I'll be planning a baby shower soon, but I don't think I have it in me to put so much work into it. 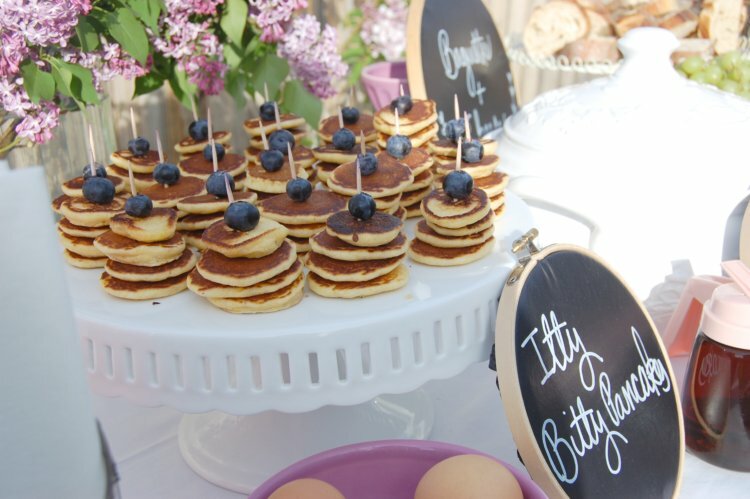 I love how you used little chalkboards for the food labels...and those itty bitty pancakes are so cute!!! You are an awesome party planner! Pinterest is so addictive isn't it??? Idaho does lilacs really well. The food spread is seriously so awesome. 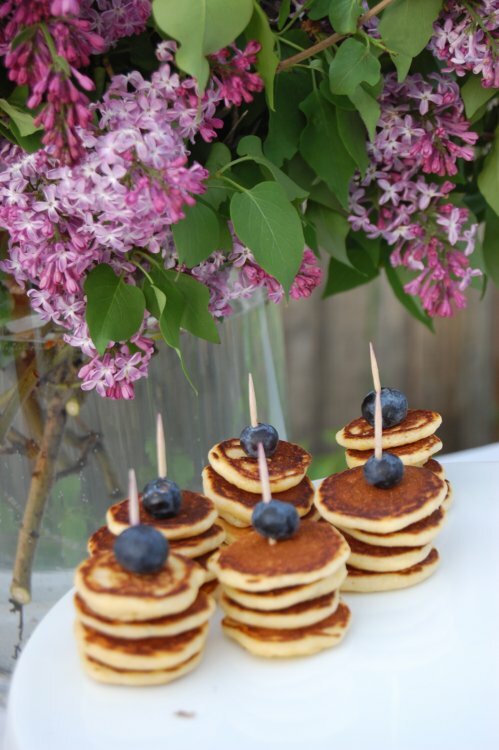 I love the mini stacks of pancakes. And all drinks taste better when they come from glass bottles like that. Total class! I loved every little detail! Thanks for sharing. Gorgeous, Mandy. Sooo my style. love everything about it! 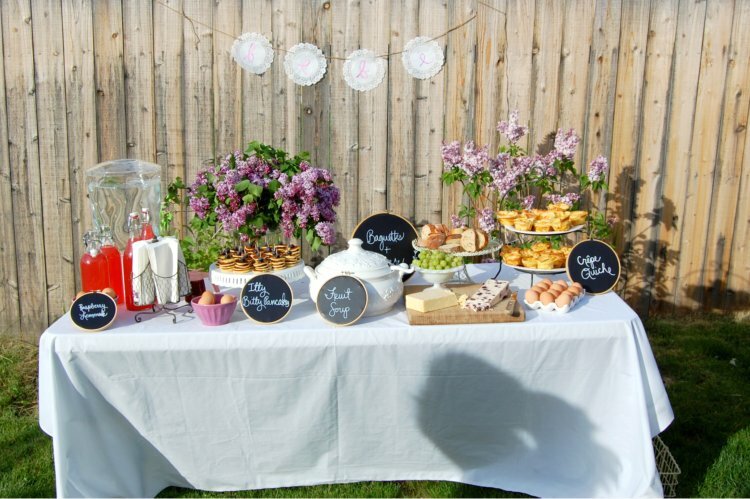 What a special rustic chic baby shower it was! In my opinion, party decorations were simply flawless. Loved their decoration ideas thoroughly. My sister’s first baby shower party was organized recently at Seattle venues and it was equally awesome.